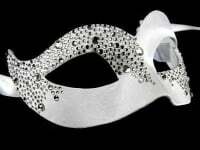 A deluxe mask, the Stuzzicare Filigree Swarovski Edition comes to you from the mask makers in Venice with a Certificate of Authenticity. This timeless piece of Venetian art sparkles in colourful splendour and will complement your selected masquerade ball costume beautifully. The Swarovski crystals glimmer spectacularly in reds, blues and greens among the delicate black lace filigree (laser cut metal) to create a flattering look. Its tactile quality making it light and easy to wear, the Stuzzicare fits comfortably around your head with multi-coloured satin ties keeping it in place. Like all the masks in our luxury Venetian collection, we have selected the best genuine handmade masks from specialist Italian producers of Venice’s famous masks – we want you to feel your best. In medieval times, the mask makers, or Mascherari, were highly respected for their skill. They formed an artisans’ guild and enjoyed special social status in the city. The masquerade mask still stands out to symbolise Venice’s rich history and the annual Carnevale di Venezia. It has survived throughout the centuries. Even a two century break in the tradition didn’t last. In the 1980s, a one-off carnival revival sparked the annual celebrations that take place today and the Venetian masquerade mask became the signature of the Venice Carnival once more. The first masks were made not for the Carnival but for a practical use – to conceal the face. In a city where so much overcrowding restricted privacy, a mask allowed its wearer to be free for a while from society’s restrictions. It was useful at times to be able to move around the city incognito. Today, for two weeks every year leading up to Shrove Tuesday, Carnival splendour takes over Venice. And we offer this to you, in the form of the luxury Stuzzicare mask. Gorgeous and individual – no two masks are the same - you will want to keep the mask as a souvenir to mark the occasion of your special masquerade ball. 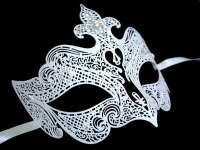 Order your deluxe masquerade mask today and take advantage of free post, packing and delivery.